Handcrafted from the best in American hardwood, this upholstered Mission-style rocking chair makes the ideal addition to any growing nursery or family room. An Amish rocking chair of this style was presented to the British Royal Family as a gift from the White House to mark the birth of baby Princess Charlotte, highlighting the quality of the heritage that each Amish rocking chair carries with it. It's easy to imagine the Duchess of Cambridge passing gentle, happy hours with her daughter in the comfortable seat of this kind of chair, proving it to be the perfect place for soothing any baby, princess or not, to sleep. That said, babies aren't the only ones sure to appreciate the gentle motion of this solid wood masterpiece. 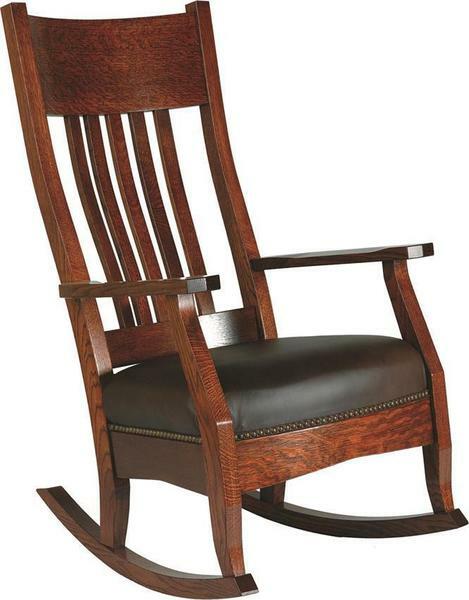 Built with quality mortise and tenon joints and then finished and upholstered by hand, this rocking chair's smooth arms and perfectly angled rockers promise year after year of ideal relaxation and comfort. Whether relaxing with a book, a movie, or soothing a fussy little prince or princess off to sleep, the Mission Rocking Chair offers the kind of dependable and luxurious everyday comfort that's impossible to find in mass-produced chairs. 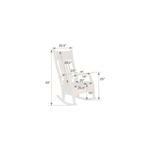 Every element of your rocking chair will be build by hand right here in the USA. If you've any questions at all about this piece, please call or email us - we're really proud of this exceptional piece. This chair was featured on Good Housekeeping's website in June 2015. Link in description. Used for calming newborn baby and reading.